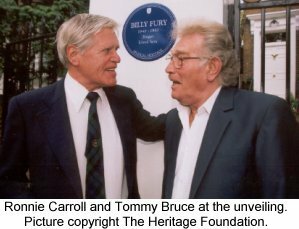 A blue plaque marking Billy's former residence at 1 Cavendish Avenue St Johns Wood London NW8 9JE was unveiled by The Heritage Foundation on Sunday September 28, 2003. A map showing the location is at the bottom of this page. A Musical Heritage Blue Plaque was unveiled at the former home of the much-loved and missed legend of British popular music/rock 'n' roll, Billy Fury. Many of his friends and musical contemporaries were in attendance at both the unveiling at at the lunch held later at Le Meridian Grosvenor House Hotel, Park Lane. The Heritage Foundation and their patron Lisa Voice mad ethe event a wonderful tribute to an artiste who is still held in the highest esteem by the musical industry and his fans. There was a tremendous turnout for the unveiling of the plaque. Billy's fans turned out once again to express their loyalty amd affection for Billy. Most of the celebrities who came knew Billy, and many considered him as a friend. One thing is for sure, we all miss him as much as we always have. P. J. Proby, Billie Davis, Frank Allan, Ronnie Carroll and Tommy Bruce were among the 60s stars. One man I was very pleased to see there was Hal Carter. Hal has been far from well recently, so I would like to take this opportunity on behalf of all of us who like and respect him better health in the future. It is right and proper that Hal should be there because, as we know, he had a great deal to do with Billy both professionally and personally. The occasion was enhanced by his presence. Lisa Voice spoke of Billy at the unveiling and it was plain to see that she was deeply moved by the occasion. Later at the lunch, the president of The Heritage Foundation, Anita Harris, paid tribute to Billy and thanked Lisa Voice for making the event possible. The contribution made by The Heritage Foundation cannot be praised too highly. The event was supported by the Billy Fury fan club, the Sound Of Fury, with several members in attendance. These included Clare Mehmet-Nugent, Jackie Clark, Vic England and Chris Eley. Money raised on the day, including the proceeds of auctions, made �000 for The Billy Fury Memorial Fund and �650 for Alder Hey Children's Hospital. Once again, Lisa Voice spoke about Billy and was barely able to control her emotions. It was a very moving experience as she shared some of her memories with us before introducing Fury's Tornados and Colin Gold, who gave an evocative performance of some of Billy's songs - a very moving tribute to a unique performer. I was anticipated that Billy's mum Jean and his brother Albie would attend, but sadly, due to ill-health, they sent their apologies the night before. l am sure that all in attendance wish them both well. A great day for all concerned. Thanks are due to Lisa Voice, The Heritage Foundation and who who came to help to make the day so special.